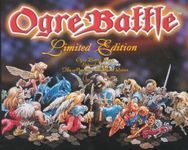 Ogre Battle: March of the Black Queen is a strategy game originally released on the Super Nintendo. The player is the leader of a revolution fighing to liberate the people from the dark Zeteginian Empire and its leader the Mage Rashidi. This revolution will lead the player and his army across more than twenty stages ranging from oceans, mountain ranges and even floating islands in the sky. The player must gather allies and build his army by recruiting, leveling up and equiping individual soldiers and monsters. These characters are then arranged into units of up to five characters that are deployed onto the battlefield. The player does not directly control the actions of his soldiers but does direct the squads across the map to encounter enemy squads and liberate towns. Once battle is joined the squads will trade attacks on a seperate battle screen until either an entire squad is defeated or all limited number of attacks have been used. The player may only influence this battle by the use of several different tactics settings and through the use of powerful Tarot cards that can sometimes win a battle singlehandedly. The game's many features such as treasure hunting, recruiting neutral characters, the deep squad building system and the many classes of soldiers lead to a variety of viable strategies. Depending on the choices made and allies recruited the player can recieve any of thirteen seperate game endings. The game's title was indeed inspired by the rock band Queen's second album Queen II.